This is a picture of Mark as he tries to steam open twenty newsletters we were about to send out, but found we needed to make an important correction first. 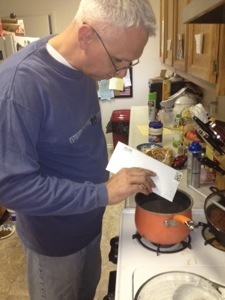 Mark was trying to rescue the stamped envelopes by gently steaming them open! He claims he saw this process in a MASH episode where Radar is trying to read Frank’s mail! Stacey you never lack for entertainment! Love it! How funny!! Love you all! Every time Ann Berkley sends news of you folks we pray for you. We are doing good here in Florida retired from IMB, but we still do allots of volunteers work in the Amazon and thru out Brazil, 6 months out of the year.. We might go to Mozambique next year to see what God is doing with John and Wanne Dina. Do you remember them? Well, a small note just to tell you that we do love you, hugs and lots of love on the girls and the boys. In His grace, Gil and Lya Santhon. P.S. If you do not remember who we are, Gil had a surgery on his broken neck while working in Mozamabique and Stacey was pregnant of Ben. Love you guys. So this is what missionaries do!